Father Ripperger presented the matter of the unity of the Holy Orders rather one-sidedly. Some theologians, among which most notable representative is Durandus, don't consider diaconate to be a sacrament, but a sacramental. There are still theologians who consider that. Even the old pontifical said this: "Hic solus Pontifex manum dexteram extendens, ponit super caput cuilibet Ordinando: et nullus alius, quia non ad Sacerdotium, sed ad ministerium consecrantur, dicens singulis: ...". And this "non ad Sacerdotium" is what Vatican 2 says too in Lumen Gentium 29, although it says that they're strengthened by sacramental grace. The document of the previous study on deaconesses says that those who hold that diaconate is not a sacrament aren't condemned and that V2 chose non definitive language since it didn't want to condemn anyone, since the doctrine itself isn't certain. Although majority of the theologians hold that it is a sacrament, they held the same of subdiaconate, which we know now certainly isn't a sacrament. Episcopate wasn't considered a sacrament by some up until V2 (e.g. Billot), but also, as in case with diaconate, the majority viewed it as a sacrament. V2 seems to have ruled in favor of sacramentality of episcopacy but as with everything V2 one can't be too certain, although the previous document says that V2 to does view episcopacy as a sacrament. All that being said the deaconessate must be viewed in itself and not in relation to deaconate. But that is already settled by historical research. They weren't the female equivalent of a deacon. I do agree that there is nothing to look into with another commission. What can be done is bringing back baptizing adults by immersion and thus bringing back deaconesses. That would be legitimate. But no, that won't happen. I think they will reinstitute deaconesses. I even think they'll be made at the level of lectors and acolytes, if not even prefferrable to them with all this SJW pandering to women's whims. Call me a pessimist, but hey...how things are going, i can't be an optimist. I'm afraid I agree that there will be deaconesses in the future. 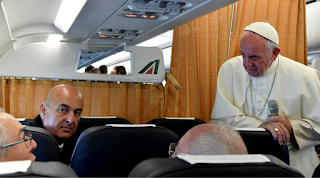 What do you think Francis intends to do with all those contemplative nuns he's going to force into the streets? He will provide a category for them - to get them more involved in 'real' service to God and 'the people.' Perfect candidates for the FrancisChurch Deaconess Initiative. Your description of the committee ploy made me laugh. Where I live we have a new hospital in the northern part of the city. But what of the south? We only have an old, smaller one. So a few months ago we saw a billboard erected in front of a cornfield that said: Future Home Of …..south Hospital! Pictured were a doctor and a couple of nurses all smiles. A while after that, pasted on the bottom of the sign was a banner that stated: Hospital Planning Grant Approved! So I'm betting we get a new hospital. But, hey, I guess this keeps people busy and the tax dollar circulating through the community. Haha. True. I think the essence of that post was that I no longer feel the need to follow the current events of the Vatican and offer a running commentary on them. It doesn't mean if something strikes my fancy I'm not going to write about it now and then. I think it just meant I feel no obligation to keep up with everything that's going on. Pope Francis practises what he preaches and that is "make a mess". The goal here as with Amoris Laetitia and of his other actions since ascending to the papal throne is confusion and we know from whom that comes. "Only a baptized man (vir) validly receives sacred ordination." The Lord Jesus chose men (viri) to form the college of the twelve apostles, and the apostles did the same when they chose collaborators to succeed them in their ministry. The college of bishops, with whom the priests are united in the priesthood, makes the college of the twelve an ever-present and ever-active reality until Christ's return. The Church recognizes herself to be bound by this choice made by the Lord himself. For this reason the ordination of women is not possible. I was so upset over the new feast day, that I went home and looked up the solid Catholic blogs and news stories, hoping someone else might have the same thought. Unfortunately, I never found any complaint about the new feast day...only glowing reports. Thank you for your article, because it helps me to articulate what I was trying to say regarding the new upgrading of Saint Mary Magdalene's Day to a Feast Day. It's not that I have anything against Saint Mary Magdalene. It's just that her feast day is being added to the feast days once only held by the Apostles. Doesn't that make one think about the fact that the Apostles are the 1st priests/bishops and now Saint Mary Magdalene also has a Feast Day?? ?...and wouldn't the pro-women-priests feminists use that to try to push forward their "cause"??? Also, the print-out piece was going on and on about women and how a woman was one of the first to be there at the Resurrection. I believe there was also a notation about women being there at the foot of the cross, etc., etc., etc. I could just hear the radical feminists wheels turning in their heads! Even though Jesus never ordained women and never intended to ordain them and there will never ever be women priests in good standing in the Catholic Church, many souls can still be lost in the pride and arrogance in the railing against the Catholic Church's teachings. It just seems ill advised to raise her day to a feast day. I just wonder,... Why did her day have to be raised to a feast day?... and... Why did it have to be raised to a feast day, NOW that there is a committee looking into "deaconesses"? It's just an observation. I thank you for your very interesting and excellent article. God bless you. I think you need to get the facts straight. Mary Magdalen has always had a Feast Day on July 22nd. All Francis did was elevate this Feast to a First Class feast. She has had a feast day on that day for centuries. But I do object to making it about feminism though. St. Mary Magdalen was an obligatory commemoration and was elevated to a feast. This was due to her being the "Apostle to the Apostles" (Apostolis Apostola), and since the Apostles have a level of a feast it is fitting that she would have the same rank too. I've seen the names of some of those on the commission. Dr Phyllis Zagano has been an outspoken proponent of a female diaconate, and has been appointed to the commission, but she will be met by those who have studied the sources identical to hers, without the burden of her erroneous preconceptions. Thus she will find herself outmatched. Some of what sounds unbelievable on the subject, is actually more misleading than anything else. If writers of the ancient Church were to speak of "sacramental ordination" ("chierotonia" being the Greek for "ordination," which was the term applied to the deaconess), they would have meant something very different, much less specified or defined, than we would mean today. But, if you don't know that, among other things, and can convince an audience that you are correct (which in a sense you would be), it would be difficult to know whether one is being led down a garden path. That is one of the problems with the conversation on the subject, the other being the prospect of ill intentions ascribed to the Holy Father, where there may be none at all (which gives itself away in his answer to the assembled on the subject). In 2012, I wrote an extensive piece on the history of the female diaconate, which was a revision of that which appears in the EWTN Online Library. It will likely be updated in the coming year to reflect more recent developments. In presenting it here, I stand by its fidelity to the teachings of Holy Mother Church, and in deference to the judgment of the Apostolic See. Most of the push for the ordination of women is coming not from nuns, but from barely observant lay women in the church. Since when did they have anything intelligent to say that ought to be listened to? Man is given the role of the spiritual divining rod for his wife. Women ought to be silent in the churches, as we are explicitly told. Now we know why!